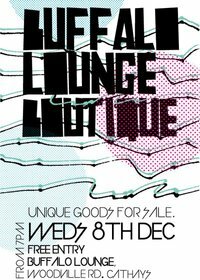 Just a brief post to let you know about the next Buffalo Boutique and it's little sister event Buffalo Lounge Boutique. It's a good way to shop and enjoy some cocktails at the same time. Stalls sell vintage bargains, hand-made crafts and all the best from local designers. You might find a great, unique gift which is better than giving someone a gift that you got in a 3 for 2 offer from Boots! Putting together and outfit post for you all ready for the weekend and I've got a few new lovely buys to show you. I am also currently writing a contribution for We Are Cardiff which is pretty exciting.